I noticed a long time ago that even people I respected as highly intelligent and effective in their lives struggled with self-advocacy. Self-advocacy is widely recognized as an essential skill for each student in order to contribute to post-K-12 success as an independent citizen. Are we failing to teach that skill, or are many adults failing to retain it? When students’ IEP’s and Section 504 plans included language such as “Student will let teacher know when he doesn’t understand the homework assignment,” I have wondered how these students will achieve this goal when so many of the very capable adults I’ve known might well have failed to accomplish it. Just last evening, a woman I admire, with academic and career credentials anyone would be proud to have, described her inability to ask a person whom she had hired to do work in her home to deliver the result he had been hired to deliver. The problem wasn’t that the worker was unable to meet my friend’s needs, but that my friend was uncomfortable simply asking for what she was paying for. Maybe my friend’s reluctance was a creature of past discouragement. If one doesn’t think “asking” will work, why put oneself “out there”? Poet Maya Angelou said “Ask for what you want and be prepared to get it!” Maybe we’re somehow afraid of success. Or maybe self-advocacy is too often identified with being “pushy” or “aggressive,” rather than task-oriented and self-assured. Are people reluctant to go after their needs because they simply are insecure about how to do so? But let me encourage you a bit, at least as self-advocacy applies to your position as a pupil transportation professional. Consider carving out those requests that you must make for the sake of your student riders, from those things you’d just like to have in your work environment. Practice asserting yourself with supervisors to get the equipment, the changes, the personnel that you need to keep students safe. When self-advocacy is, in reality, for the benefit of students whose safety depends upon you, you’re obligated to take the plunge. Maybe if you (1) identify what they need; (2) develop a plan to get it for them; and (3) carry it out with good timing, respect, and awareness of the style and limitations of the people with the power to give you what you need for students, you’ll find you’re successful – at least some of the time. Maybe, then, you’ll try it in your personal life as well. 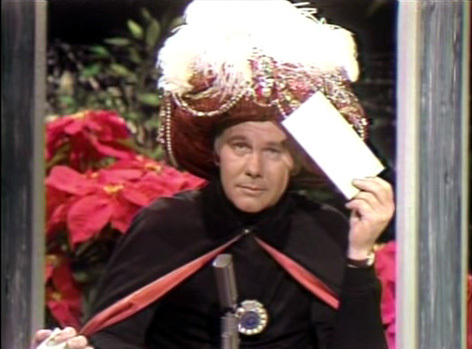 Long-time s tar of the Tonight Show, comedian Johnny Carson frequently played the role of Carnac the Magnificent, a “mystic from the east” who could psychically “divine” unseen answers to unknown questions. When student safety is in your hands, you can’t depend upon others being mind-readers. You’ve got to ask for what you need to keep students safe. Posted on February 21, 2013, in Best Practices and tagged Communications, Psychology. Bookmark the permalink. 1 Comment. I think sometimes we feel we are not worthy or we don’t have the right to ask for help buit you know whaty – we are worthy and we DO have the right. Especially school bus drivers and monitors who often times feel like they don’t want to “make waves”. As you so aptly stated, when their ssfety and the safety of the children is involbed – ASK. Don’t be afraid of hurting someones feelings. You (we all) deserve it!